In the lands of the Housatonic River, change comes slowly. Since the reign of Akbar II there have only been five barons and four baronesses Beyond the Mountain. 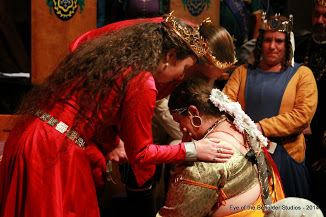 Therefore when the coronet of the thirteenth oldest Barony in the Known World changes – a Barony older than all but four Kingdoms – it behooves the subjects of the East to take notice. Such transitions should be marked by pomp, and ceremony, and attended by signs in the heavens, so seldom do they transpire. 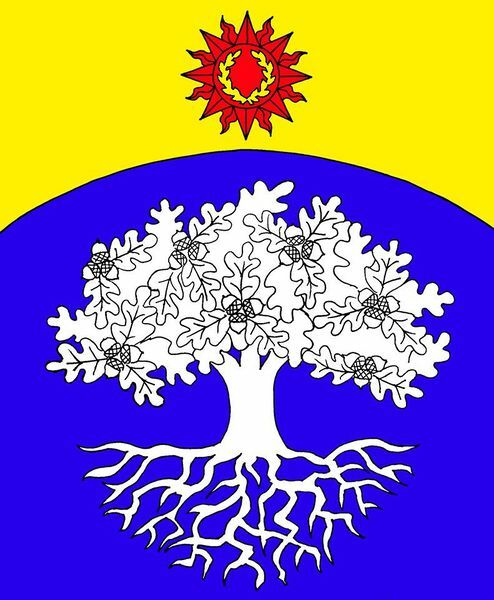 On the 19th of May, such a ceremony shall occur.Dorian and Eloise, having held the lands of the white oak in the King’s name for six years, will retire from the Housatonic thrones, and the coronet will change for only the fifth time in forty-six years. 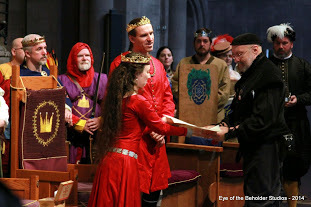 Therefore, join us to celebrate the Investiture and acclamation of Lord Mark the Red Hand and Lady Gwenllian ferch Llewellyn ap Henry as the sixth Baron and fifth Baroness Beyond the Mountain! There will be activities of all types to celebrate the occasion. For the martially inclined, there are many options. For heavy list, a “misfortunes of war” tournament (Are you feeling lucky? It all turns on what fortune you draw…) For the fencers – a cut and thrust tournament and a random forms tournament. Does your fancy run to ranged weapons? The archery tournament features targets from ten yards all the way out to eighty yards (Yes, I DID say eighty yards), with open shooting available. Thrown weapons? How could we have eighty yards worth of field and NOT have room for thrown weapons? There will be open throwing available.Come try it out! Not feeling warlike? We have fun for you also !There will be games to play such as kubb, quoits, croquet, a palio race, and a May pole to dance! And when the coronets, like the day have passed… the food! 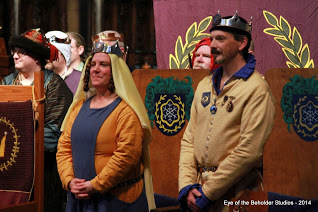 In honor of our new Baron and Baroness, Lady Sisuile Butler will be presenting us with a delectable feast, including that most traditional dish in the Barony Beyond the Mountain – cream of mustard soup. Please join us for the day and the evening, and do honor to our new Baron and Baroness. In the land of steady habits, it will be many years before the opportunity arises again. On September 16, A.S. 52, 2017 C.E. Invited into court by their majesties, serenaded by Hugoline the Delicate, Their excellencies began their court with welcoming everybody to the day. They first gave a gift to the King and Queen of the East, a bounty of treats native to our Duck Land. At the Last Court of Their Majesties Brion and Anna, it was announced that Master Rowen Cloteworthy and Jamilia al-Suba al-Hadid min Bhakail al-Sheikha al-Mu’allim (Mistress Suba al-Hadid) will be Invested as the next Baron & Baroness of Bhakail by Their Majesties Ioannes & Ro Honig on June 3rd at Bhakail Investiture and King’s & Queen’s Rattan Champions. 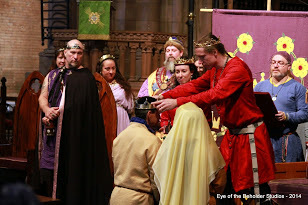 Investiture of the new Baron and Baroness of Concordia, Jean Paul and Lylie, took place on Saturday among the festivities of Bjorn’s Ceilidh, our celebration of the Celtic New Year. 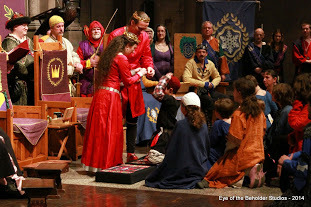 Previous Barons Pierre, Angus, Balthazar and Emerson passed down the coronets to Their Majesties, while reciting the lineage of our Barony, so all would know our history. 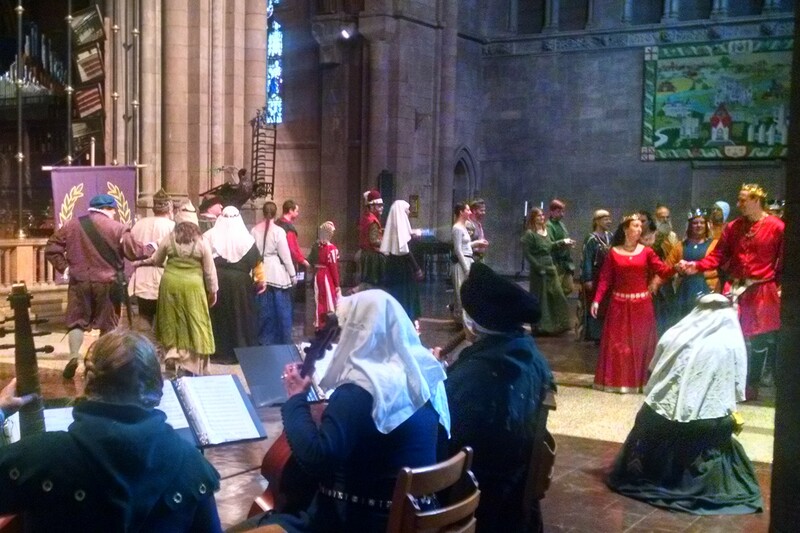 After First Court everyone joined in the festivities. 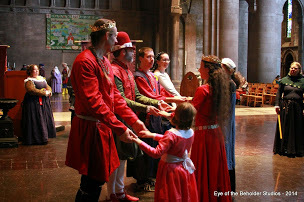 The King and Queen could not pass up a chance to dance with their subjects, and the Baron and Baroness showed off their newly learned skills. Many newcomers took part in our traditional games of sheep toss, haggis hurl and arm wrestling, and were skilled enough to take home prizes. Among the pleasures of the second Court, Constantine became a member of the Order of the Tiger’s Cub, and Lady Pakshalika Kananbala was welcomed into the Order of the Silver Crescent. The afternoon ended with a game of live chess. There was much worry when Queen Thyra was taken out of the game early, but her side played skillfully, and she was brought back in when a pawn reached the end of the board. The game was brought to a successful conclusion in time for everyone to enjoy a sumptuous feast. The evening ended with the traditional remembrances of those who have passed before us, and the lighting of the new flame for the new year. Come, good gentles! Raise your banners and your voices high in celebration of the new Baron & Baroness of Bhakail. Join us as Their Majesties, Gregor & Kiena, invest our new Baron & Baroness, and for feasting & revelry only the likes of Bhakail can offer. The feast will be prepared by Baroness Alesone Gray of Cranleigh, with a full menu to come. There will be much music, and a chance for artisans and brewers to display their crafts & skills. Details are forthcoming.